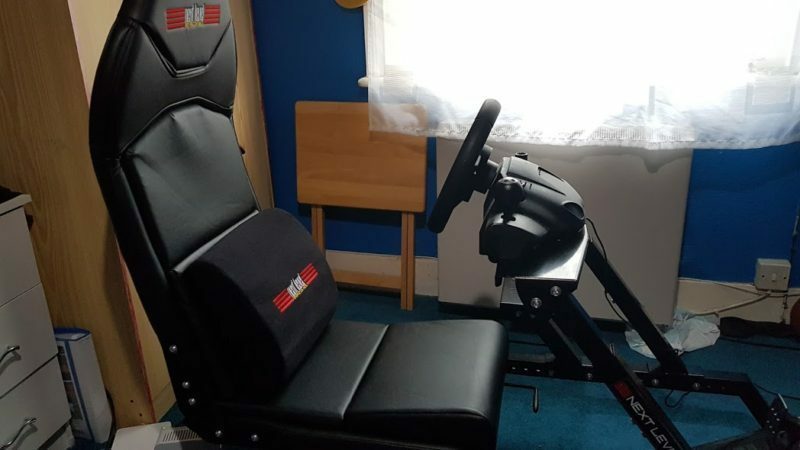 If there’s one thing that rings true about the sim racing rig market, it’s that it can become oversaturated. How does one stand out from the crowd? 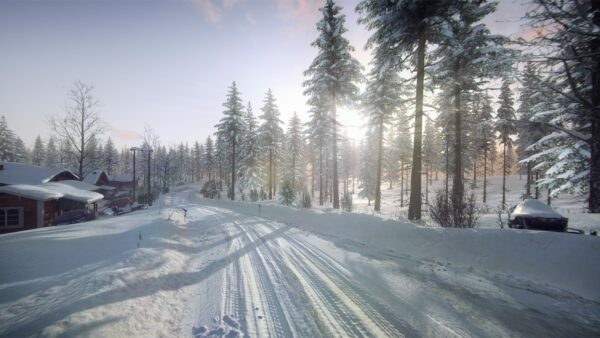 Next Level Racing is hoping its latest creation can do just that. 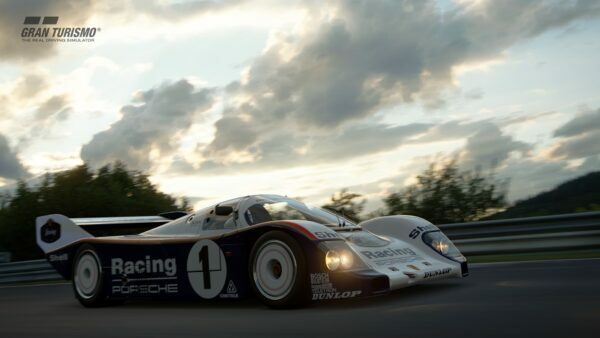 Sim racing, by its nature, covers a lot of disciplines. 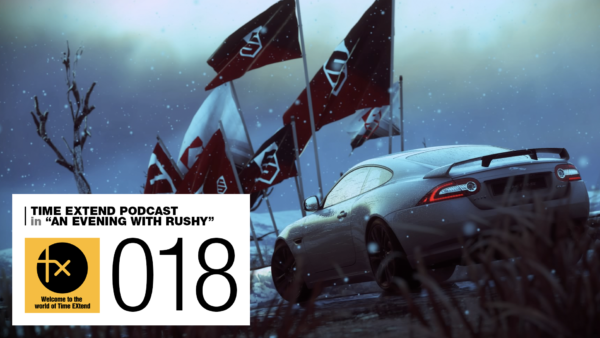 Sure, you might have your favorites, but in the hunt for immersion, a racing rig can play a big part. A more traditional seating position is great for sports car racing, but what if you also like dicing with open-wheelers? As the kids say these days: get you one that can do both! The F1GT is what Next Level has come up with, and we recently got a chance to put it through its paces. Some holes didn’t line up due to misaligned parts. There are just over 20 individual parts that make up the F1GT. Having the parts labelled with letters or numbers would’ve been nice, as well as pointing out bolt measurements. There was a lot of guess work involved during assembly. When you have to email the company that makes the rig you’re building, you know things aren’t going so well. 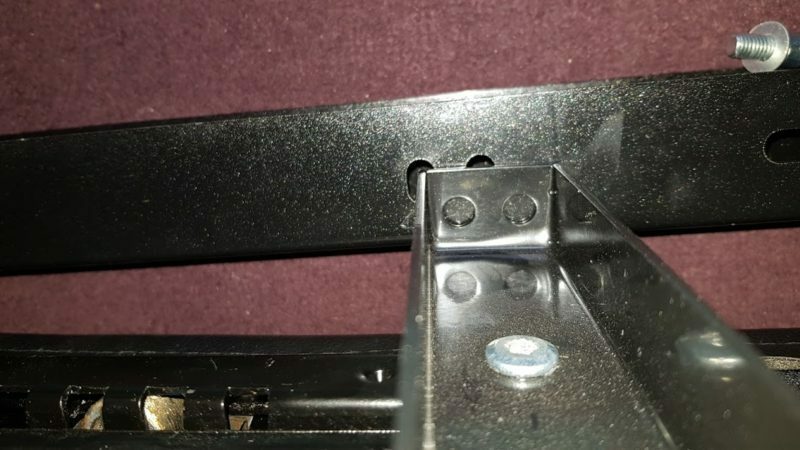 The sliders on the seat weren’t lined up out of the box, this meant that two metal bars that hold the seat in place wouldn’t fit. A week of back and forth emails with the team at Next Level Racing followed. It turned out that some screws needed loosening so we could adjust the sliders into place. The handle on the supplied Allen wrench was too short to generate enough manual torque to turn the screws. Next Level Racing recommended using electronic tools to loosen them, but we were afraid this would strip the heads. We ended up using an Allen wrench with a long handle that we already had to finally loosen them. This frustration could’ve been avoided if the instructions were more clear or if the supplied Allen wrench had a longer handle. A build that should’ve taken an hour took almost a week due to email communication. Having said that, the customer service at Next Level Racing was top notch. We got replies to our emails within a few hours, instructional videos were also sent to make sure we were on the same page. 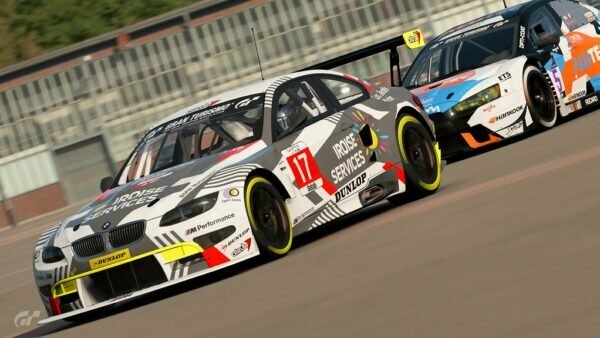 UPDATE: Since publishing this review, Next Level Racing has published a new set of instructions which are significantly improved. You can download the new instructions here. The leftover parts we had at the end of the build. The materials used in the design of the F1GT are of a very high quality. Everything is metal. The bolts are thick and the washers and nuts are sturdy. The product itself arrived packaged very well. 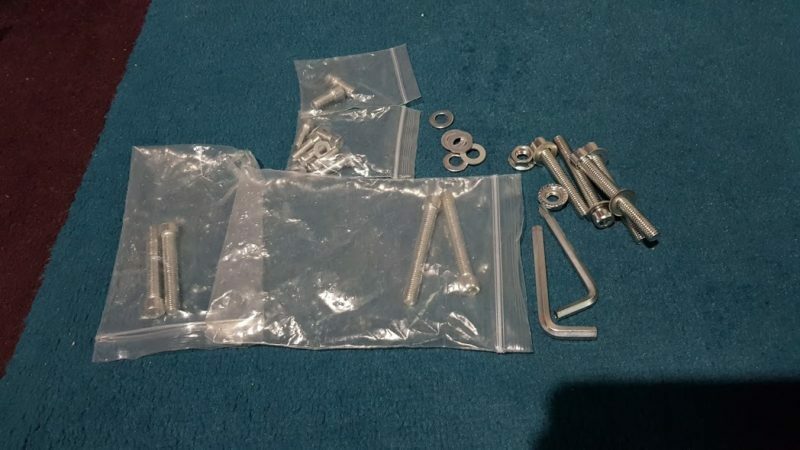 All of the individual parts were in bubble wrap bags, with one or two of the bags including specific washers and screws pertaining to specific parts. However, none of the bags were sealed. This created a minor problem in that some washers and screws fell out into the box and were no longer with their specific parts. All of the other fittings – including the instructions – came in a sealed plastic bag. Two Allen wrenches were also included. However for as good as the build quality is, the supplied instructions were poorly written. Spelling mistakes, grammatical errors and a general lack of proper information caused a few headaches. There were also some major errors concerning what went where. The gear shift plate assembly wouldn’t fit with 50mm bolts as per the instructions, we ended up having to use some of the supplied 60mm bolts instead. Another problem arises if you want to use the GT mode with the pedal plate in F1 mode. We weren’t able to attach the shifter plate properly because we ran out of nuts. At the end of the build, we ended up with leftover bolts and washers with no idea on where they were supposed to go or what they were for. Some bolts overlapped others and we weren’t sure if this was normal. The instructions are so basic and minimal that for certain parts of the build, we just guessed and hoped. The F1 configuration features a higher seat rake and raised pedals. If there’s one thing that stands out about the F1GT, it’s how adjustable it is. There’s 13 holes for the seat and 22 for the wheel and pedals. However, we were reluctant to adjust anything because of the length of time it takes to do so. The seat is on a slider, which is a great addition. 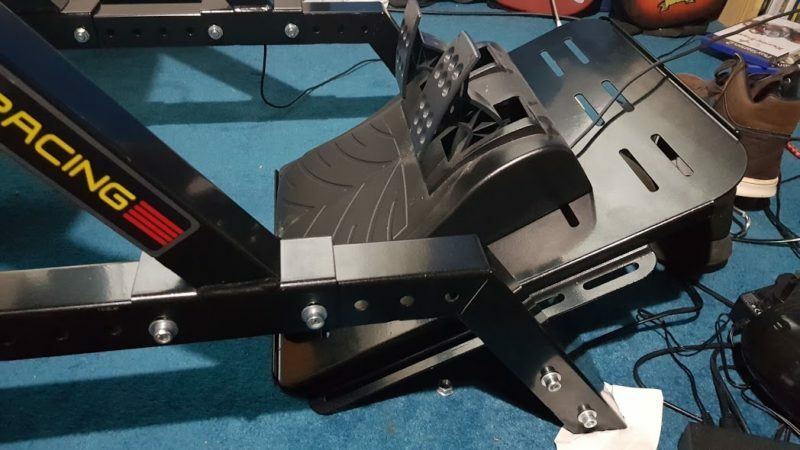 But we would’ve welcomed another slider for the pedal and wheel plates since these also need moving to make sure everything fits your specifications. The angle and height of the wheel plate can be changed, as can the pedal plate. The big selling point of the F1GT is how you can either set it up in an F1 style or a GT style. In the F1 configuration, the seat is low and the pedal plate is high. This means sitting with raised legs, similar to how they are for a real F1 driver. The point of this in the real world is to produce a lower center of gravity for the car. The GT mode was more comfortable and easier to adjust. The GT layout has a more conventional seating position and lower pedals. It also allows for the addition of a shifter plate, which can be attached to the left or right side. Out of the two, we preferred the GT set up due to the ease of adjustability. 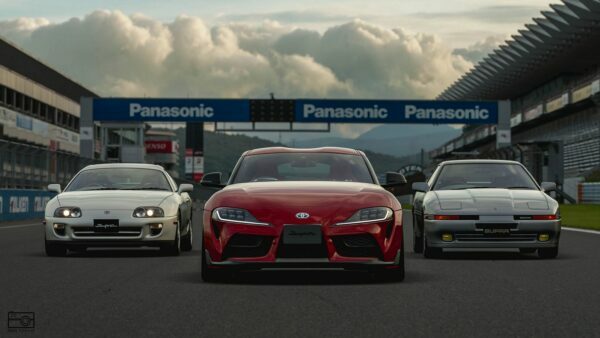 But this will of course be up to personal preference and the types of racing games you enjoy. This adjustability is great until you realize how hard it is to move things around. There’s no lever to change between F1 and GT, instead you have to undo several bolts and reposition almost the whole rig. 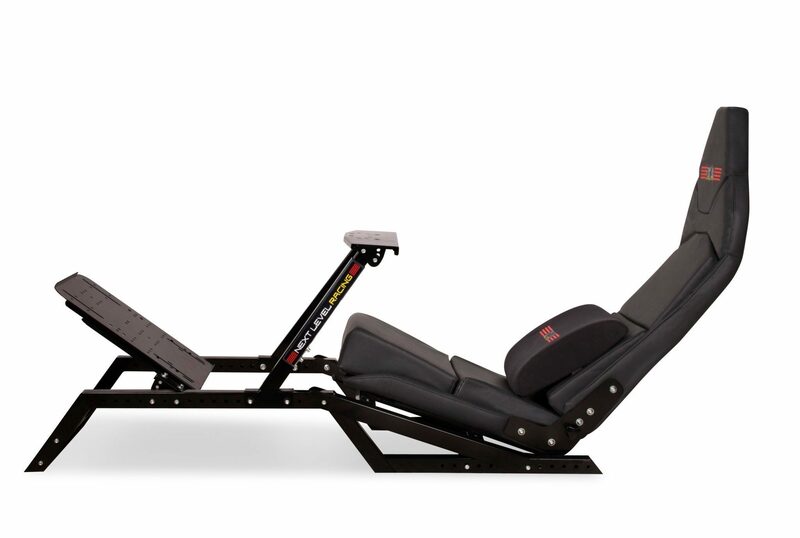 The fact that the seat weighs over 30lb only adds to the difficulty. It took us 40 minutes to change from F1 to GT mode. Not great if you’re switching between F1 2017 and Project CARS 2 and looking for a quick turn around. The time would decrease with practice, but it’s such an extensive process that it’s almost not worth it. If a friend wants to use your rig and is taller or shorter than you, adjusting it for them and then back to the way you like it could easily take an hour. The DFGT pedals sat nicely. The pre-drilled holes are an excellent addition for higher end sets. The F1GT is extremely stable due to great design and quality materials. The weight of the parts is testament to how well made the product is. Still, this does make it rather heavy and difficult to move, as well as creating deep grooves in carpet. Having said that, you’ll be safe in knowing that the F1GT won’t budge, even on the highest force feedback settings. A lot of energy goes through a rig when you’re on the edge of control. The F1GT feels like it will easily hold up. There are pre-drilled holes on the wheel, pedal and shifter plates. This is ideal if you have a high-end wheel and pedal set that bolts into place. We tested the F1GT with a Logitech Driving Force GT — an entry level wheel. The wheel clamped easily to the plate and didn’t budge once attached. The pedals, however were not so stable. We use bungee cords on the DFGT pedals to increase tension. However, we couldn’t attach the cords due to the design of the pedal plate. Of course, a standard pedal configuration should have no such qualms. The lumbar cushion is a smart addition. The rig is very comfortable in both F1 and GT modes. The seat is deep and well-cushioned, with great support for both the legs and back. Next Level Racing even throws in a lumbar support cushion if you need a little extra comfort in the lower back area — something that could be essential in marathon races. It’s almost a guarantee that you’ll be comfortable in the F1GT due to the generous amount of adjustability. The downside is that it takes so long to adjust anything other than the seat slider. As mentioned before, we’d have loved a slider for the wheel plate and pedal plate. It was very tempting to settle for a setup that was almost there, rather than perfect due to the difficulty of making adjustments for comfort. High quality materials make up the F1GT, more than enough the justify its price tag. However for $500, you’d expect a lot better ease of adjustment and some more detailed instructions. 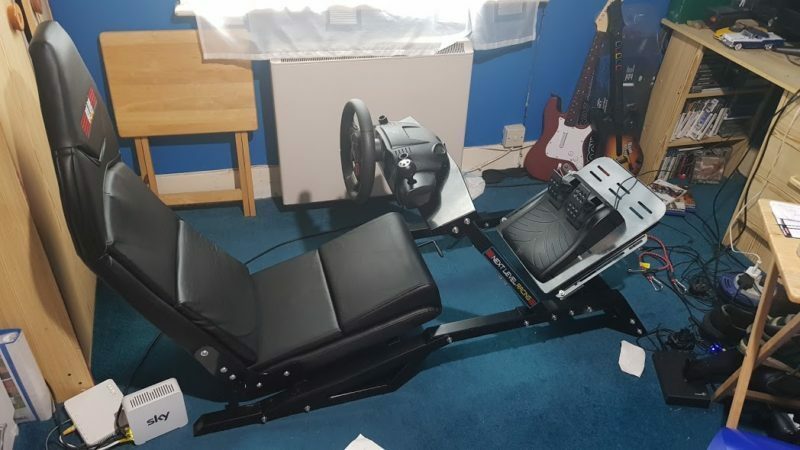 With the lack of properly supplied equipment, poorly written instructions and the difficulty of adjustments, we can’t honestly recommend the F1GT at this price point. It’s a shame, too. When eventually built, the F1GT is very sturdy and a great accompaniment to any sim racing setup. On the other hand, heading to the local hardware store to buy more equipment shouldn’t be a requirement when you’re forking out half a grand. The F1GT from Next Level Racing is a victim of its own success. It’s extraordinarily adjustable but difficult to adjust. It’s very robust and well made but this makes it difficult to assemble and move around a room. There’s an overall lack of versatility and inspiration. 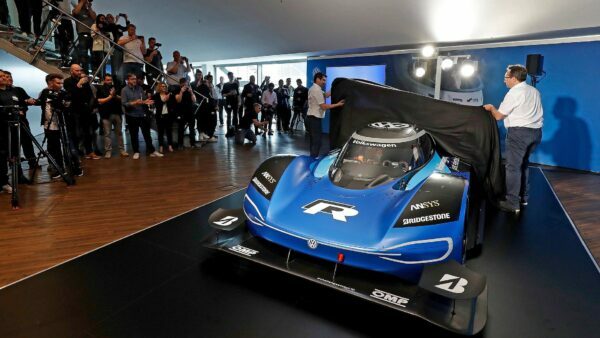 If Next Level Racing had come up with an easy way to adjust between the F1 and GT configurations, this rig would be near the top of the pile. Despite these drawbacks, the F1GT is extremely solid and surprisingly comfortable. You can attach virtually any wheel and pedal set to the rig and — once adjusted — it feels tailor-made to your requirements. 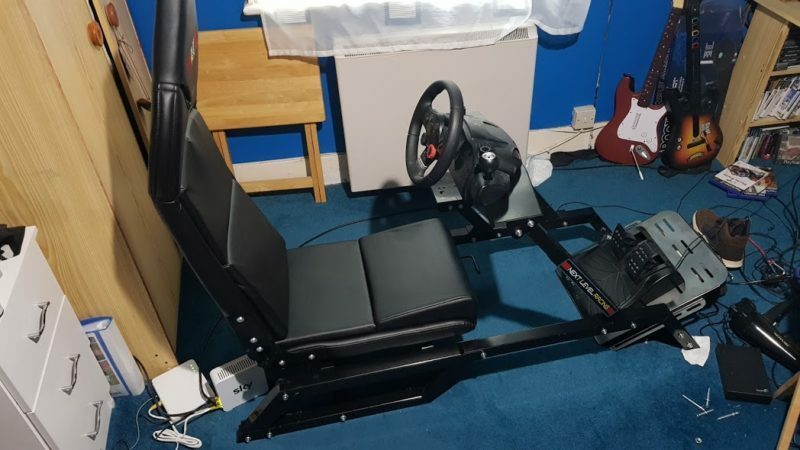 If you’re willing to see past the lack of imagination when it comes to making adjustments then the F1GT can be a welcome addition to any sim racing set up. 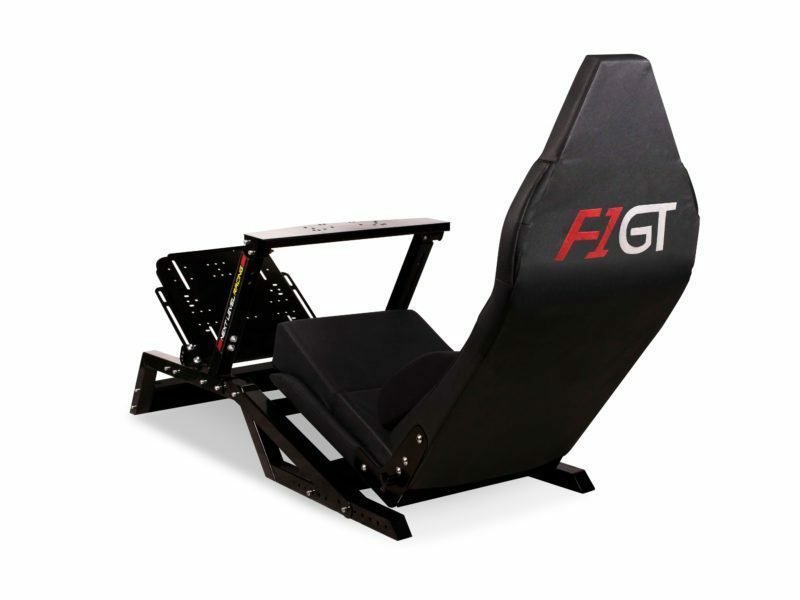 The F1GT is a solid and very comfortable cockpit with impressive adjustability. However, it's let down by how time consuming making those adjustments are. The F1GT consists of an all-metal frame with high quality fittings. It’s a shame these fittings don’t attach as they’re supposed to. One of the most adjustable rigs on the market. 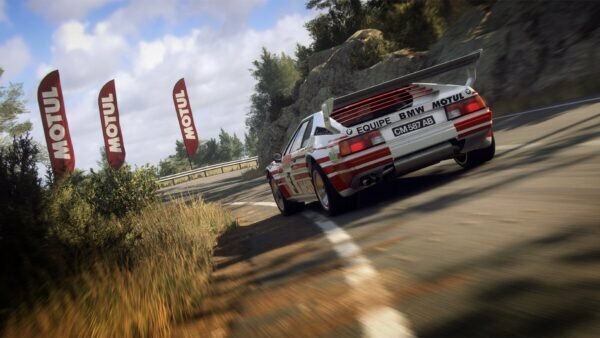 Changing parts to switch between F1 and GT modes is an unnecessary headache. You could sit in this all day. The F1GT will keep you comfortable for even the longest of endurance races. Due to poorly written instructions and misaligned parts, a build that should’ve taken an hour took several days. It’s not moving. The F1GT feels almost bolted down. This does make it difficult to move around the room, though. The F1GT feels very premium to sit in. But for $500, you’d at least expect all the correct parts to be included.